Lviv Mayor Andriy Sadovyi wished a happy birthday to Hou Yifan, a Chinese Grandmaster, who takes part in Women’s World Chess Championship Match in Lviv. Mayor and Hou Yifan have met at Leopolis Hotel. 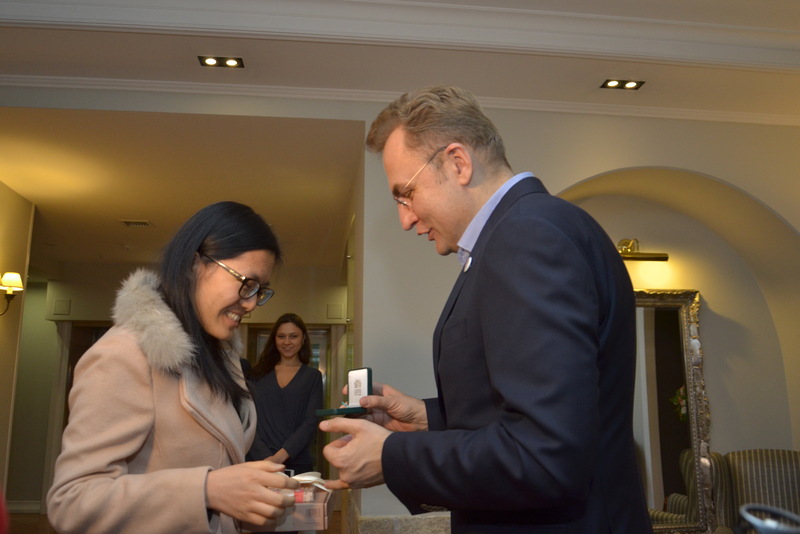 Andriy Sadovyi presented a coin depicting King Danylo and Lviv sweets to Chinese chess player. Hou Yifan today, onFebruary 27th, celebrates 22nd birthday. ‘World Championship takes place in our city on its 760 anniversary. This is a very significant event to host it in Lviv. We have 30 GMs in Lviv. And this is a great honour. I would like chess were more popular not only in Lviv but also in the whole world’, said Lviv Mayor Andriy Sadovyi. ‘This is my first visit to Ukraine. Of course, I’ve heard that Lviv has a very rich history. And this can be seen in the architecture of old city. It’s very attractive’, said Hou Yifan.